Provide comfort for the family of Ernie Gendron with a meaningful gesture of sympathy. Ernest P Gendron passed away peacefully on Thursday, January 10, 2019 at Careage of Whidbey. He was 85 years of age. Ernest (Ernie) was born in Shirley, MA to Leo and Renee (Michaud) Gendron. He lived most of his life in Fitchburg, MA before moving to Coupeville, WA 25 years ago. 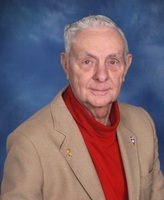 Ernie was a member of St. Mary Catholic Church and the Knights of Columbus, Bud Dorr Council #13422. He is survived by his children, Robert (Linda); Steve (Terry); Paula (Kevin); Lisa (Rick) and Sharleen (Andy). He was preceded in death by his first wife, Irene and his second wife, Marianne. A funeral mass will be celebrated on Monday, January 28, 2019 at 10:00 am at St Mary Church, 207 N Main Street, Coupeville WA. To send flowers in memory of Ernie Gendron, please visit our Heartfelt Sympathies Store. We encourage you to share your most beloved memories of Ernie here, so that the family and other loved ones can always see it. You can upload cherished photographs, or share your favorite stories, and can even comment on those shared by others.